Hailed by capitalist literary critics, Trotskyites and anarchists as a masterpiece, the mediocre book Animal Farm has served a very important role in distorting the history of socialism in the Soviet Union. Modern editions of the book hail author George Orwell’s selfless journalistic integrity in producing the work, which is said to be a totally accurate portrayal of life under socialism. But a close examination tells differently. Especially important in understanding the true reason Animal Farm is still crammed down the throats of the public are the two film versions of Animal Farm. 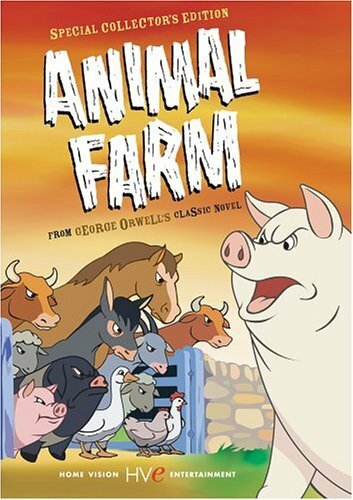 “The CIA obtained the film rights to “Animal Farm” from Orwell’s widow, Sonia, after his death and covertly funded the production as anti-Communist propaganda. Some sources assert that the ending of the story was altered by the CIA (in the book, the pigs and humans join forces) to press home their message[.]” . The CIA agent Howard Hunt, who bought the film rights, also helped set up production of the 1984 movie, which also changed the ending of the original book to be more anti-communist. “The head of the CIA operation to obtain the film rights was none other than E. Howard Hunt, later famous as Nixon’s Watergate burglar. As part of the deal, Sonia Orwell requested that she get to meet her idol, Clark Gable; this was arranged. A large portion of the budget ($300,000 out of a cost of over $500,000) was supplied by the United States’ Central Intelligence Agency, Office of Policy Coordination, through one of its shell corporations, Touchstone Inc” . Animal Farm has become a classic of capitalist propaganda. First published during World War II, it conveniently packages decades’ worth of lies about socialism in the U.S.S.R., and more specifically the leadership of Joseph Stalin, into an easy-to-understand book small enough to fit in your pocket. Animal Farm is supposed to be a classic satire and critique of socialism; however, George Orwell never went to the U.S.S.R., and received all the information he knew from anti-communists. The book is not journalism at all, and should not be considered the be-all end-all of learning about Soviet socialism. The original book and the two films have roughly the same basic plot. 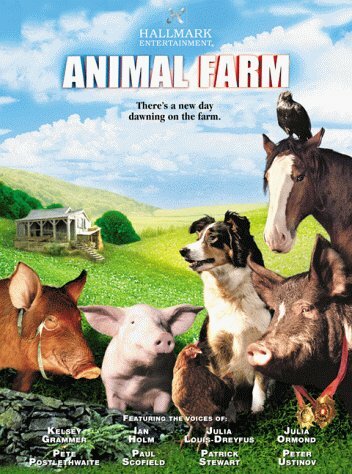 Subtitled “a political fable,” Animal Farm tells the tale of the poor and ill-run Manor Farm, managed by the drunken farmer Jones, who abuses the animals. The neglected creatures are called to a meeting by a wise old pig named Old Major, who tells them that if they will rise up together, they can overthrow Jones and create a new world where all animals will be free and equal. Led by a clever pig named Snowball, the beasts run Jones off the farm and take all his property for themselves, proudly renaming the plot Animal Farm. Conditions improve at first, but the pigs (smartest of the animals) begin to keep certain luxuries, like apples, for themselves. The greedy and mediocre pig Napoleon uses a gang of trained dogs he has brainwashed to run Snowball off the farm and institute a new, terrifying society not at all like the one envisaged by Old Major. Life for the pigs gets better and better, but the other animals are murdered and starved and battered into an oppression worse and more horrifying than existed when Jones ran the farm. Orwell made no attempt at subtlety – even children can see without much difficulty that Animal Farm is a crude metaphor for the Soviet Union – Napoleon is Stalin, and Snowball is Stalin’s rival Leon Trotsky, who was justly exiled from the U.S.S.R. in the mid 1920s. The first of the two films based on the book, released in 1954 and made possible by funding from the notorious American Central Intelligence Agency, is a dark and gloomy cartoon that, true to the book, paints a disgusting picture of Animal Farm and the struggle between the white pig Snowball and the black and conniving Napoleon. The second film, released in 1999 and produced by Hallmark, is a live action film boasting a cast of stars including Patrick Stewart, Seinfeld’s Julia-Louis Dreyfus and Fraiser’s Kelsey Grammer. Both of these films have been made easily available to anyone with a computer, with the first film streaming for free on Hulu and the second on services like Netflix and YouTube. What makes these films important is the way they deviate from Orwell’s book, especially when it comes to the endings. In his original work, Orwell closes the novel with a scene in which the animals realize that they are no longer able to tell their bloated pig leaders from the human farmers who oppressed them. It is a closing of cynical misery, driving home Orwell’s anti-revolutionary idea that any attempt by the workers to create a better world for themselves would only end in the same kind of tyranny they overthrew. But both of the films go a step further. The 1954 animated ends quite differently than the book. The mistreated animals from many farms join together and, instead of attacking their human owners, march defiantly to Animal Farm and kill Napoleon. We must bear in mind who it was that funded this change – the CIA. The message is simple, and directed at the Soviet peoples – “Not only is your new government atrocious, you can and must overthrow it now!” The CIA, of course, was ever working for this to happen, but failed miserably during the Soviet Union’s time as a socialist country. The 1999 live action version was made decades after the Stalin era, and does not bother leaving the plot and end open to interpretation. In the ending sequence, in a clumsy attempt to be poetic, a heavy rain “washes away” Napoleon’s government, the animals welcome a loving new human family to the farm to boss them about, command them, consume them and exploit them. The film closes with a shot of the sickeningly stereotypical family driving up to what was once Animal Farm, their smiles suggesting that the problem all along was just that Jones was a bad owner. All the animals really needed was to be owned and exploited by a family more like the Cleavers. In these films, the biased and deceitful nature of Animal Farm is laid bare. Going a step further than the slanders of Orwell’s book, they openly call for violent counterrevolution in the Soviet Union. The films themselves – taken as art – are as bad as their message. It is a real chore to sit through the creepy “Dr. Dolittle” talking animals of the 1999 Hallmark film or the poorly animated and clumsily sinister tone of the 1954 release. The dialogue is absolutely painful, and the voice performances, even Patrick Stewart as Napoleon, are phoned-in and uninspired. The artistic elements are secondary, both for us and for the people who made them. What is important to understand about films like Animal Farm is why they are made – for propaganda. Both films, as well as the original book, have no appeal as art whatsoever other than their obvious metaphor for the Soviet Union. Without that, the films are hollow. The pseudo-history of the U.S.S.R. presented in Animal Farm is junk, but we are pushed to accept it as fact. Many people do, since Animal Farm is a fictional work, there is no need for citations and it can be difficult for the defenders of socialism to argue against its more specific, ludicrous claims because they are hidden within a fairy tale. Worst yet, many people accept the attitude of Animal Farm, believing like the film’s donkey Benjamin that no matter what they do or how hard they fight, things will only end up worse than before. The two Animal Farm films are worth seeing only as a way to get to know what you’re up against and as a great glimpse into how the capitalist media uses popular culture to promote its ideological objectives. But as films in their own right, they are contrived and soulless. Anyone looking for a good film to relax with for an hour or so should look elsewhere.